-A scholarship is available for one male and one female high school student-athlete. -The current amount of the scholarship is $2000 each. -A panel of judges will select a male and female Student-Athlete of the Month. -At the conclusion of the school year the panel will select the Student Athlete of the Year (both male and female). 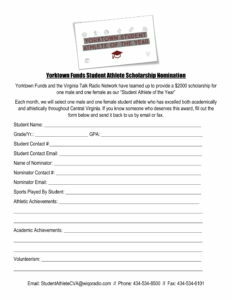 The Virginia Talk Radio Network has teamed up with Yorktown Funds beginning in 2014 to provide a scholarship for student-athletes in the listening area. Community involvement is huge for our radio group and we see scholarship as one way to give back. -Only Varsity athletes will be considered and preference will be given to seniors. -Eligible student-athletes must perform with distinction away from the athletic fields as well. -Each month the Student Athletes of the Month will be profiled and recognized on all radio stations across the Virginia Talk Radio Network. 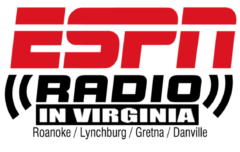 -At the end of the year, the two Student-Athletes of the Year will be recognized on all radio stations across the Virginia Talk Radio Network and awarded the scholarship. -Nominations will be submitted by the Athletic Director by the end of each month. -Athletic Directors will nominate one male and one female student-athlete of the month from their school. -The Athletic Directors will present the athletes’ statistics for the month, their GPA and an example of their dedication to both their sport and their academics. Other extra-curricular activities will be considered as well. If you know someone who deserves this award, fill out the form located below.